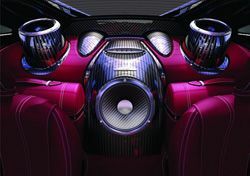 Pagani Huayra Sonus faber sound system to be demonstrated at Munich High End Show | What Hi-Fi? On demonstration at next month's High End Show, which opens in just over three weeks in Munich, will be the new Sonus faber audio system for the Pagani Huayra supercar. The €1.4m Huayra will form the centrepiece of a car audio exhibit also including Dynaudio's system for the VW Touareg and a Burmester-equipped Porsche Cayenne at the show. The Pagani/Sonus Faber system is described as 'the first step of a partnership between the two brands', and uses carbon fibre cones, chassis made from avional – a high-strength aluminium/copper/magnesium/silicon alloy – and gunmetal, and Neodymium magnets in the speakers to keep weight to a minimum. The amplification delivers a total of 1200W, while digital signal processing tunes the sound to the interior of the car, as well as allowing the balance and equalisation to be tailored to the owner's requirements. The High End Show is at the MOC, Munich, and is open to the public from Friday, May 10th until Sunday, May 12th. For full details see the show website.